Here’s the list of Toys ‘R Us deals for Black Friday 2017! Also included are the links to the same (or similar) items on Amazon so you can make sure you’re getting the best deal! 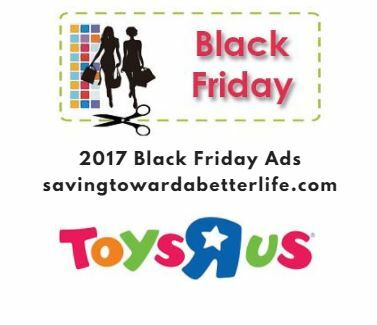 Toys ‘R Us Stores open 5PM on Thursday, November 23rd BUT deals are available online beginning Wednesday, November 22nd at 9:00pm. Doorbusters are noted with an * and are available from 5pm to Midnight on Thursday, November 23 while supplies last. Some of the Amazon linked items are comparable models or brands if that specific item wasn’t available. Always check Amazon prices when available because I learned when I was birthday shopping last month that Amazon can best Toys ‘R Us… in fact, three LEGO sets my son wanted were cheaper on Amazon!